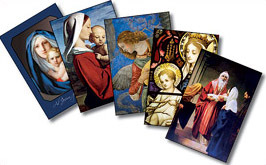 Keep Christ (and Mass) in "ChristMass" this year with our beautiful cards. Two designs (Nativity and Epiphany to chose from) from the Beuronese-style murals of Dom Bonaventure Ostendorp, OSB and Dom Raphael Pfisterer, OSB. The text inside the card is taken from the Postcommunion of the Third Mass of Christmas Day and reads "Grant, we beseech Thee almighty God, that as the Savior of the world born on this day, is the Author of our heavenly birth, so He may also be to us the Giver of immortality. Amen." Sorry, no Rudolph the Red Nosed Reindeer or elves here. 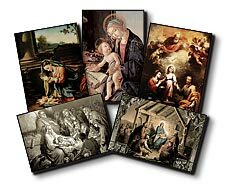 Pack of 25 with envelopes, Nativity. Pack of 10 with envelopes, Nativity. NEW DESIGNS FOR CHRISTMAS 2009!! different vibrantly colored designs. The cards are a convenient 5x7 size and include quality ivory envelopes. different vibrantly colored designs. The cards are a convenient 5x7 size and include quality white envelopes. Viderunt omes fines terrae salutare Dei nostri. Traditional cards (4 1/2 x 6) with matching envelopes to send to those who should know that you have requested the celebration of the Holy Sacrifice of the Mass. Tasteful, discreet, apostolic. Pack of 10. Traditional cards (4 1/2 x 6) with matching envelopes to send those who should know that you have requested the celebration of a Requiem Mass. Tasteful, discreet, apostolic. Pack of 10.